Marble countertops are all the rage! When designing kitchens and bathrooms, choosing the best countertop material can be an extremely overwhelming process. With so many different options to choose from it can be hard to make the right selection for you. Recently, marble countertops have risen in popularity among designers and homeowners alike. As a result, here is everything you need to know about marble countertops so you can decide if a marble countertop is a right choice for you. 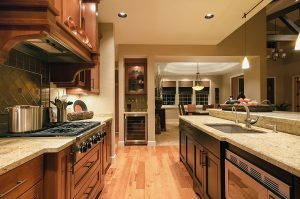 While you may have decided that marble is the material you want to use for your countertop, there are different types of marble that can be chosen and each one provides its own unique benefits. Carrara: Typically, Carrara marble is white with a ton of gray veining throughout. The amount of veining then creates a much more gray overcast throughout the entire slab of material. As a result, Carrara marble works really well in cool-toned kitchens and is often the affordable option when it comes to marble. Statuary: This type of marble is a little more expensive than Carrara but still relatively affordable. While it also has a white background, statuary marble will typically feature a lot less gray veining when compared to its Carrara counterpart. Statuary marble usually works really well in a cool, open-concept kitchen. Colorado Gold: If you are looking for a marble that is white and simple, look no further than Colorado Gold. With its minimal gray veining and super-white look, it can almost go well with any kitchen design concept. In fact, adding Colorado Gold to your kitchen can instantly give it a modern feel. Calcutta Gold: Just as the name suggests, this marble has flecks of gold in it. As a result, Calcutta Gold marble works really well in absolutely any space. It has the unique and distinct capacity to tie any room together. However, Colorado Gold is oftentimes one of the more expensive of all the marble types available. This entry was posted on Friday, June 23rd, 2017 at 1:37 pm. Both comments and pings are currently closed.